This week a small blog post about the Company Portal app enrollment experience, for Windows 10 Desktop devices, that has been recently added to the Company Portal app. This new experience enables the end-user to perform the enrollment procedure during the initial sign-in to the Company Portal app and aligns the enrollment experience with the other supported platforms.. This blog post will show this new enrollment experience, the new alterative enrollment experience and the end result. Now let’s start by looking at the main new end-user enrollment experience on Windows 10 Desktop devices via the Company Portal app. This complete experience is nothing more than the following 4 simple steps. 4 The end-user is shown a success message and only needs to click Done to continue in the Company Portal app with a successfully enrolled Windows 10 device. The alternative new experience, for Windows 10 Desktop devices, is available when the end-user clicks Skip for now during step 3 mentioned above. This enables the following experience in the Company Portal app. 3 The end-user is brought to the standard Windows 10 enrollment experience. The end result during both new enrollment experiences is the same. In both cases the end-user will end-up with a workplace joined and Microsoft Intune managed Windows 10 Desktop device, as shown below. 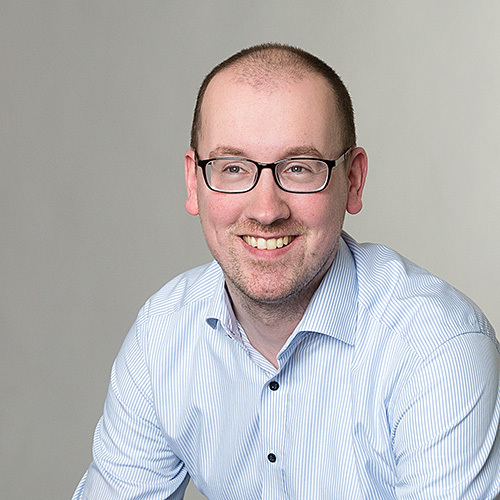 This week I’m back in ConfigMgr and I’m back with custom Terms and Conditions. A few months ago I did my latest post about custom Terms and Conditions. That post was completely focused on Microsoft Intune standalone. Starting with ConfigMgr 1511 it’s now also possible to deploy custom Terms and Conditions through Microsoft Intune hybrid. Custom Terms and Conditions can be deployed to end-users to explain how device enrollment, access to work resources, and using the Company Portal affects them and their devices. End-users must accept the custom Terms and Conditions before they can use the Company Portal to enroll and access their company data. 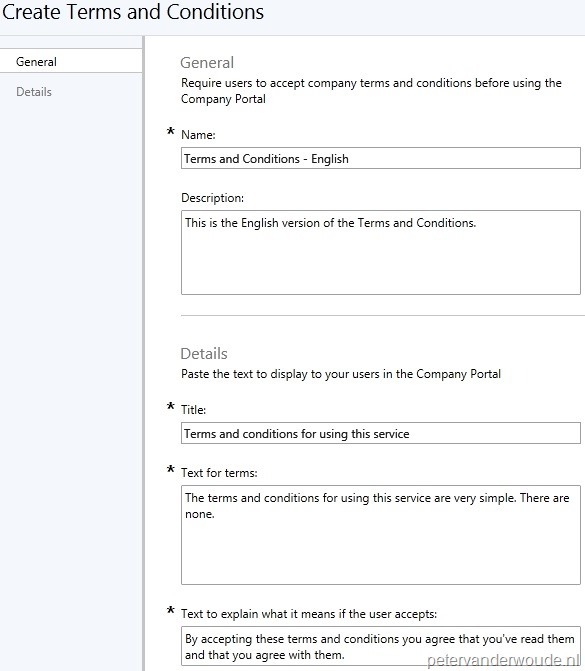 In this post I’ll show how to create, deploy, update and monitor custom Terms and Conditions in Microsoft Intune hybrid. I’ll also briefly show the end-users experience. Keep in mind that custom Terms and Conditions are deployed to users and that users only need to accept the Terms and Conditions once, unless specifically configured in an updated version of the custom Terms and Conditions. Now let’s start with the configuration of custom Terms and Conditions. I’ll first go through the configuration steps to create custom Terms and Conditions, followed by the configuration steps to deploy custom Terms and Conditions and I’ll finish with the configuration steps to update the custom Terms and Conditions. The first configuration activity is creating the custom Terms and Conditions. This configuration activity can be performed by simply going through the following six steps. 6 On the Completion page, click Close. The second configuration activity is deploying the custom Terms and Conditions to an user collection. This configuration activity can be performed by simply going through the following three steps. The last configuration activity is updating the custom Terms and Conditions. This is an optional activity that is only required when an update to an existing custom Terms and Conditions is required. This configuration activity can be performed by simply going through the following three steps. Keep the current version number, and require only new users to accept the updated terms: [Select this option when typos, or formats are fixed in the custom Terms and Conditions]. Before I’ll go to the reporting capabilities, for the custom Terms and Conditions, I think it’s important to first show the end-user experience. Depending on the number of targeted custom Terms and Conditions, the end-users can experience the behavior as shown below. Let’s finish this post with the reporting abilities of custom Terms and Conditions. Out-of-the-box there is one report available, named Terms and Conditions acceptance, that shows which user accepted which version of which custom Terms and Conditions. That report is available in the category Compliance and Settings Management and only shows the information about end-users that accepted the custom Terms and Conditions. User Name: [Select a specific user to display]. This time a short blog post as an answer to one of my tweets of yesterday. I’m afraid this post will take away all the flair of that tweet. The picture in that tweet looked so cool, but is actually also so simple to configure. The new Software Center will actually just take the Company Logo as configured in the Microsoft Intune Subscription Properties. Navigate to the tab Company Logo, select Include company logo, Browse to the JPEG or PNG that should be used and click OK.
Let’s end this post with showing the end-user experience again. The end-user will see the newly configured Company Logo in the top-left corner of the new Software Center. That makes sure that the end-user will experience a similar look-and-feel on all its devices. 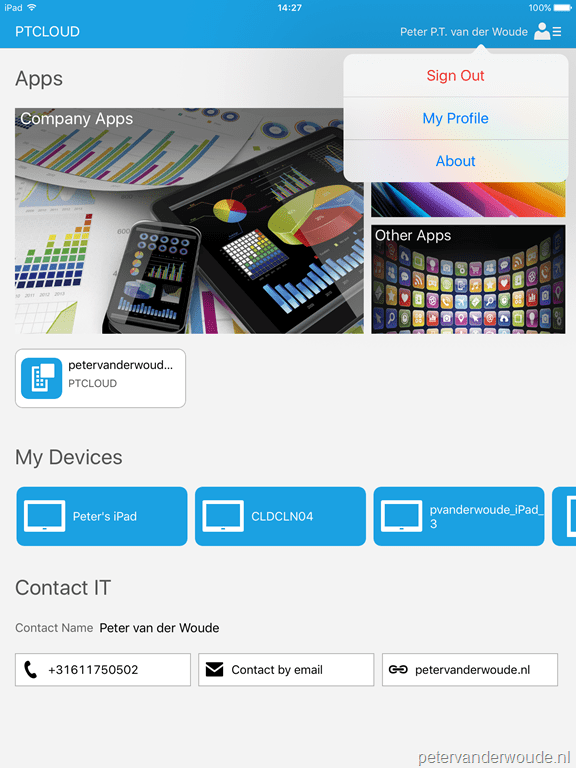 Here is an example of the new Software Center next to the Company Portal app on iOS. This week a short blog post about the new ability in the updated Microsoft Intune Company Portal app, for iOS, to send diagnostic information. Before it was always fun to explain somebody the method to get the Company Portal Diagnostic Information, as it would require the end-user to open the Microsoft Intune Company Portal app and simply start shaking the device. Actually, this is still a possibility to get the Company Portal Diagnostic Information. New in the latest update of the Microsoft Intune Company Portal app, for iOS, is the ability to send the Company Portal Diagnostic Information via the menu of the Microsoft Intune Company Portal app. This is a new Microsoft Intune Company Portal app ability and is not related to the iOS version. Now let’s have a look at what the new end-user experience looks like. The end-user has to open the Microsoft Intune Company Portal app and simply walkthrough the following two steps. The first step is to click on the username and to select About. The second step is to click on Send Diagnostic Report. Note: After selecting Send Diagnostic Report an email will open, like with shaking the device, that includes the Company Portal-Log.log. And we’re back in the Company Portal app. Not just because I think that the Company Portal app is awesome, but also because there’s a new Company Portal app related capability added, during the August 2015 update, to Microsoft Intune. That new capability is that it’s now possible to deploy multiple custom Terms and Conditions for enrollment and company access. 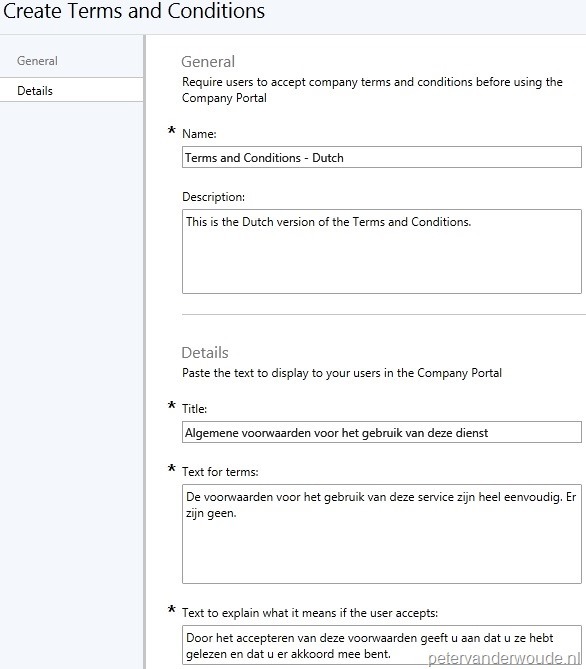 A while ago I did a blog post about Custom terms and conditions for using the Company Portal of Microsoft Intune and this post will be an updated version of that post. However, this post will not go into as much detail about the use of different versions, of a single custom Terms and Conditions, as that part is still applicable in the same manner. In this blog post I’ll show that the capability to create custom Terms and Conditions has been relocated to the Policy node in the Microsoft Intune administration console and that it now also can be configured like a policy. That means it’s possible to create multiple Terms and Conditions and that’s possible to deploy multiple Terms and Conditions. This can be very useful when it’s required to make the Terms and Conditions available in different languages, or when different custom Terms and Conditions are required for different parts of the company. One important thing that’s still the same, is the fact that Terms and Conditions are deployed to users and that users only needs to accept the Terms and Conditions once. Now let’s start with looking at the new way to configure custom Terms and Conditions. First I’ll go through the steps to create and deploy custom Terms and Conditions and than I’ll continue with showing the end-user experience of that configuration and deployment. To create a new policy, perform the three steps mentioned below. For every additional custom Terms and Conditions the same three steps apply. Text to explain what it means if the user accepts: <Provide a text describing what it means when the user accepts the custom terms and conditions>. A good thing to keep in mind is that with editing the created policy an additional option of Decide whether to require users to re-accept updated terms will show. This option can be used to increase the version number, or to keep the current version number. Increasing the version number will require all users to accept the updated terms and keeping the version number will required only new users to accept the updated terms. To deploy the new policy, perform the four steps mentioned below. For every additional custom Terms and Conditions the same three steps apply. On the Manage Deployment page, Add the user group(s) and click OK.
A good thing to keep in mind with deploying multiple custom Terms and Conditions is their behavior when multiple custom Terms and Conditions are deployed to the same user. I’ll show that behavior during the end-user experience, but it’s good to note that it will simply merge the multiple custom Terms and Conditions in to one. To test the end-user experience, I’ve created two custom Terms and Conditions. I’ve deployed these to two different groups and that actually gave me expected behavior. The first custom Terms and Conditions is created in English and deployed to a group with my English end-users. That makes that all my English end-users experiencing the behavior as shown in the Windows Phone 8.1 device below. The second custom Terms and Conditions is basically the same. The only difference is that it’s created in Dutch and deployed to a group with my Dutch end-users. That makes that all my Dutch end-user are experiencing the behavior as shown in the Windows Phone 8.1 device below. Now that I’ve created multiple custom Terms and Conditions it’s time to see the end-user experience when the end-user is either in both groups, or when both configurations are targeted to the same group. These end-users will experience the behavior as shown in the Windows Phone 8.1 device below. In this scenario I’ve tested the English and Dutch configurations by deploying them to the same group and by adding the end-user to both groups. In both cases the end-user experience was as shown here on the side. This is not something I would want when I’m deploying multiple custom Terms and Conditions because of the language of the end-users. However, this might be ideal behavior in a case with multiple parts of the company having different custom Terms and Conditions. Now that I’ve shown the creation and deployment of custom Terms and Conditions it’s time to look at the reporting capabilities of this feature. Basically this is still the same, that means that it’s still possible to see the difference in accepted version of the accepted Terms and Conditions. What’s new is that it now allows me to run a report either based on the end-user(s), or based on the company terms. That allows me to use configurations of the report as shown below. This weekend I posted a small tweet showing the tabs, in my browser, to the different Company Portal apps. In that same tweet I promised the overview that follows in this blog post. By now there are 8 different versions of the Company Portal app and specific to Microsoft Intune that number is 7. These Company Portal apps differ in things like product, platform and availability. This blog post will describe the different Company Portal apps, their platforms, their usage, their main requirements, their availability and, if needed, their important notes. All that information should help you with picking the right version of the Company Portal app and all that information can be found in the following table. Configuration Manager Company Portal app (.appx) Platform: Windows 8 and later. Usage: This app allows the user to view and install applications that are made available to the user and communicates directly with the ConfigMgr on-premises infrastructure. It’s an alternative for the Application Catalog, meant to create a single user experience together with the Microsoft Intune Company Portal app. Requirement: The app needs the registry key HKLM\SOFTWARE\Policies\Microsoft\CCM with value PortalPackageFamily set to Microsoft.CorporateAppCenter_8wekyb3d8bbwe. Microsoft Intune Company Portal app (.xap) Platform: Windows Phone 8 and later. Usage: This app helps the user search, browse and install apps that are made available to the user and it communicates through the Microsoft Intune online service. It’s required for those users that still have a Windows Phone 8 device. Requirement: The app needs to be signed with a Symantec code-signing certificate, as described in this article. Also, to deploy apps to devices with Windows 8 and later, there are sideloading requirement as explained in this table. Note: When this app is used in combination with Windows Phone 8.1 devices, block the Microsoft Intune Company Portal app from the Windows Phone Store. Microsoft Intune Company Portal app (.appx) Platform: Windows Phone 8.1 and later. Usage: This app helps the user search, browse and install apps that are made available to the user and it communicates through the Microsoft Intune online service. It’s meant for those users that do not have access to the Windows Phone Store. Requirement: The app needs to be signed with a Symantec code-signing certificate, as described in this blog post. Microsoft Intune Company Portal app (.appx) Platform: Windows 8 and later. Usage: This app helps the user search, browse and install apps that are made available to the user and it communicates through the Microsoft Intune online service. It’s meant for those users that do not have access to the Windows Store. Requirement: To deploy apps to devices with Windows 8 and later, there are sideloading requirement as explained in this table. Usage: This app helps the user search, browse and install apps that are made available to the user and it communicates through the Microsoft Intune online service. Requirement: To download apps from the Windows Phone Store a Microsoft account is required. Note: When this app is used in combination with Windows Phone 8 devices, use an uninstall on the Microsoft Intune Company Portal app coming from Microsoft Intune standalone, or create a specific requirement for Windows Phone 8 devices on the Microsoft Intune Company Portal app coming from Microsoft Intune hybrid. 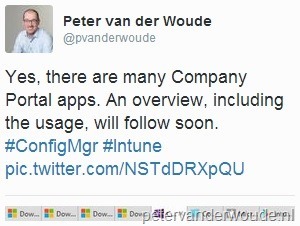 Microsoft Intune Company Portal app (Windows Store) Platform: Windows 8 and later. Requirement: To download apps from the Windows Store a Microsoft account is required. 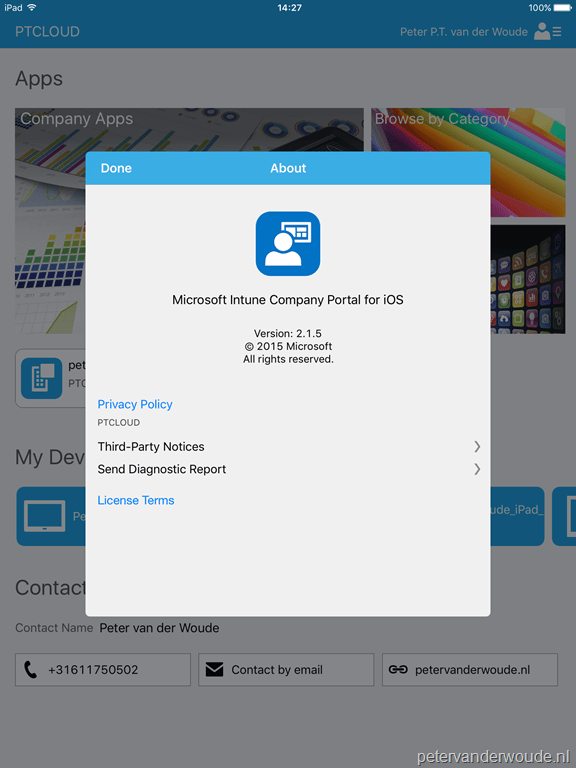 Microsoft Intune Company Portal app (Apple App Store) Platform: iOS 6.0 and later. Microsoft Intune Company Portal app (Google Play Store) Platform: Android 4.0 and later. Requirement: To download apps from the Google Play Store a Google account is required. Note: On every platform, my preference will always be the store version of the Microsoft Intune Company Portal app. These versions are always up-to-date and contain the latest features.